Wheel thrown recurved bowl with open-ended knob handle. Unglazed flat base with circular pattern from wire cutting. Matte glaze to exterior with magnesium oxide flecks. Gloss glaze to interior. I have compiled the following from anything I could find on the web about Gus. Much comes from the McLaren Pottery website, Australian Pottery at Bemboka and several other sources. There is a lot to get through, so please be patient. William George (Gus) McLaren was born in Melbourne on the 7th of November 1923 to William and Beryl, Gus became a celebrated Australian artist, animator and potter. He studies cartooning part-time two nights a week for a year at the Royal Melbourne Institute of Technology (RMIT). His artistic abilities became focuses during his service in the Australian army during World War 2. He enlisted in Western Australia on the 7th January 1942 and he later served in the pacific. He painted panels for a recreation tent for wounded Australian and allied soldiers. This work now resides at the Australian War Memorial in Canberra. In 1946 as part of the British Commonwealth Occupation forces Press Unit, Gus traveled to Japan to teach art to the Japanese and there he met and was interviewed by a young cartoonist, named Les Tanner, who also worked for BECON (a British and Allied Forces Newspaper). They produced cartoons for the newspaper they were attached to. Later Les would become a nationally published political cartoonist. By early 1947 BCOF had begun to decline and, by the end of 1948, was composed entirely of Australians. The force was dismantled in 1951, when the Japanese Peace Treaty came into effect. After Gus’ discharge on the 2nd of February 1949, the friendship endured for over the next fifty years, until Les Tanner's death in 2001. After the war, Gus moved to Sydney where he worked as a cartoonist and illustrator for the Daily Telegraph and Women's Weekly before moving home to Melbourne where he worked on The Argus newspaper, as the cartoonist "Just Gus" in 1954/55. When the Argus closed, he read a review left on a desk on a book on pottery. He found and read the book and began his career by making chess pieces from local clay. He claims never to have finished it, but he later displayed a chess set at the Australian Gallery. He later sold a chess set for 50 guineas ($105.00). His signed cartoon of four soldiers playing poker with one taking the pot and saying “Well! Well! Ten o’clock, lights out you know”, 1950, brush and ink and blue pencil, 20.5 × 26.3 cm (AWM), is the original for the gag published in the last of the Australian War Memorial’s 19 illustrated Christmas books, As you were (1950). 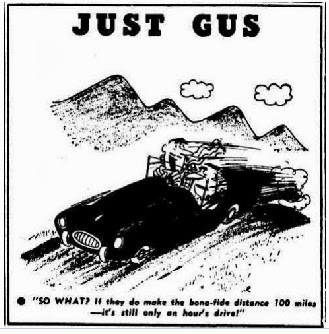 “Gus” also signed a not very good woman driver joke in Melbourne Argus 1956: “The roundabouts confuse me so I always get through them as quickly as possible”. In the early 1950s, Gus and Elizabeth (Betty) moved to Warrandyte, an outer area of Melbourne popular at the time because of the low cost of land, with artists and potters. Later (in 1955), he began potting with Reg Preston and was one of the founding members in 1958 of the Potters Cottage at Warrandyte in Victoria. Reg fired Gus’ chess pieces. (See my post on Reg Preson for more details on them.) Reg and his wife Phyll Dunn (see my post) remained friends until their deaths. They even moved in and shared a house with the Prestons for a time. He and Betty were among the founders of the Warrandyte's Potters Cottage, and as his technique developed, he moved into stoneware ceramics and more sculptural projects. He went on to have regular exhibitions in Melbourne and his work was exhibited at the National Gallery of Victoria, the Art Gallery of Western Australia, the Tasmanian Art Gallery, Shepparton Regional Art Gallery, University of Queensland and with many private collections in Australia and overseas. While he concentrated on producing and exhibiting "one-off" pieces of pottery from the 1950s through the '80s, Betty carried on exclusively with the Yarra Ridge Pottery business. Through all these years McLaren also dug clay from the Bradley's Lane site, made mud-earth bricks, and built the family home — always building extensions, always without planning permission. All this was paid for by his work as a cartoonist. He was also the main innovator in setting up Potters Restaurant, and later The Hot Pot Shop in South Melbourne, specialising in "peasant" provincial casseroles served in rugged stoneware plates that were enthusiastically souvenired. These eateries were highly successful, but he sold out once the innovative appeal had worn off. Eventually “Potters Cottage” expanded to encompass a gallery, a flourishing pottery school, and finally a very successful and well known restaurant, “Potters Restaurant” (which Gus was very much involved in the setting up). He was also one of the principle teachers at the Potters School. Gus and Reg began making pottery together using the name “Regus” (Reg & Gus). Reg taught betty slipcasting and the team expanded. Gus and Betty then set up Yarraridge pottery and together and separately, the two produced an extensive body of work. This included wheel-thrown and hand-built pieces, as well as a range of slip-cast figures designed by Gus and decorated by Betty. These designs are still being used by Betty to make figures for sale from her McLarren Pottery on the New South Wales south coast. Later they moved to their own place in Bradley’s Lane Warrandyte, but continued working at Reg’s pottery until he finished building their own studio. The house was designed by Architect John Hipwell, another member of Potters Cottage. In between his other work, Gus made mud bricks to enlarge the home and studio without recourse to permits . They first moved into a shed which later became the studio. He exchanged, at modest prices, his work with friends such as John Percival, Gareth Jones-Roberts, Arthur Boyd, and fellow potters. In the 1970s, he and Betty built a "Warrandyte" home at Merimbula, where she moved and began potting during a long separation. Once in their studio named “Yarra Ridge Pottery” they started producing animals, designed by Gus and slipcast by Betty”. During this period, Les Tanner worked on a collaborative project with the McLarens producing a satirical swipe at the establishment of the day, in the form of ceramic jugs, designed by Les and slipcast by Betty of Sir Henry Bolte, Premier of Victoria in the 1950 to 1970s They also made a Sir Robert Menzies jug. (Bob Menzies is still Australia’s longest serving Prime Minister. In 1962, McLaren became the author of Australia's first animated TV cartoon, at Channel Nine. A trailblazer, he was the co-writer, animator, artist and director of Freddo the Frog for Fanfare Films. He then worked with Hanna Barbera on Scooby Doo, and on the animated feature film Grendel Grendel Grendel, with Peter Ustinov. Gus began working full-time on animation in the 1970s. He worked on television commercials, animated feature films including a long stretch with Hannah Barbera. Gus created the character “Freddo Frog” for MacRobertson Chocolates, now owned by Cadbury Schweppes. Betty kept the pottery business going while Gus was otherwise occupied, but he would come back for short periods. Over time, Betty took over operation of the slip casting and decorating process, as well as working on her own hand-painted pieces, supplying the Potters Cottage and other galleries in Victoria. He became interested in stoneware and built a gas-fired kiln. (Stoneware is fired at a higher temperature than earthenware.) This work was becoming increasingly abstract, being less decorative and more sculptural in form using matte ash glaze. His surfaces were becoming more rugged and textural and his life-long love of Science Fiction was seemingly reflected in the wonderful and fantastic shapes of his ceramic sculptures. He continued a successful career as a potter and went on to have regular exhibitions in Melbourne and has pieces exhibited in the National Gallery of Victoria. Gus’s work has been represented in the Art Gallery of Western Australia, Tasmanian Art Gallery, Shepparton Regional Art Gallery, University of Queensland and many private collections both in Australia and overseas. Whilst Gus concentrated producing and exhibiting “one-off” pieces of pottery (and during the periods of his animation) which includes the period from the ‘50’s,’60’s, 70, and 80’s, Betty, carried on exclusively with the Yarraridge Pottery business., producing the animals, decorating and firing pieces (designed by Gus in the ‘50’s/’60’s) such as bulls, horses, lions cats etc. whilst also working on her own designs supplying Potters Cottage and other galleries mainly in Victoria. In the early 70s’s Gus and Betty purchased land in Merimbula, New South Wales and over the next few years Gus built the house, (where she currently lives). In the early eighties Betty trained their daughter Kirsty McLaren to continue the business of producing the animals in their Warrandyte studio, she ran the business for a couple of years before leaving for London in the mid-eighties to become a photographer where she currently still lives.. Their eldest daughter, Susan, after an early career in fashion modeling, after living in Europe, and is following the family tradition, and has become a ceramic artist, producing highly colourful mosaic designs and ceramic sculptures. Susan now works at the studio in Merimbula helping Beth with producing Gus' designs. She has two children Ella and Zac, and is now a grandmother to two young boys Oliver and Luca. The boys, John, headed north to Merimbula, he took after his father in his love of creative stone-walls and landscape gardening, while youngest Tim, has settled in Melbourne with his wife Janine, and son, Liam and divides his time between his passion as a jazz musician [guitarist] and computer programming. In the early 80s, after a short break, Betty began working again in her new studio in Merimbula and resumed the full and exclusive productions of the animals as well as other work that she produces and designs, continuing to supply Potters Cottage in Warrandyte (as before) right up until its recent close. Betty, now in her 80’s still continues to supply local galleries, as well as galleries far afield, the unique McLaren Pottery animals, which had it’s origins in the 1950’s right through to the present day. After Betty moved to Merimbula, NSW, daughter Kirsty ran the pottery at Warrandyte. After Kirsty left for London in the mid-1980s, Betty moved production to Merimbula where she is still producing slip cast animals to Gus's original 1950s and 1960s designs under the name McLaren Pottery. Betty's works are signed 'B Mclaren' or 'Betty McLaren'. McLaren Pottery works are signed 'MCL' or 'McLaren'. Gus’s ceramic work is signed 'Gus McLaren'. Gus has ceramic works in both public and private collections. When the Potters Cottage held its 45th anniversary in 2003, he participated in the exhibition. He also has a considerable body of work in animated films. In 1962 he directed the first animation series made for Australian television, Freddo the Frog and he was one of the animators who worked on Grendel, Grendel, Grendel, a full-length animated film retelling the Beowulf epic released in 1981. When Betty moved to Merimbula in the early 1980s, Gus remained in Melbourne, but returned to live with his family in West Richmond before his death in 2008. Early in 2008, Gus asked his daughters to take him back to Merimbula, where he lived with his family. Gus died of pneumonia and heart failure on the 29th of August 2008 at Pambula Hospital in New South Wales. He was 84. He enjoyed his morning coffee with The Age and he was buried with a copy of the newspaper on the Merimbula waterfront, enthusiastically telling visitors of his pleasure in the town, and in again being with his children Susan, Kirsty, John and Tim, and Betty, who survive him. Betty, a living national treasure is now 86 and the last of the original Potters Cottage group. She is still working at Merimbula with the help of daughter Susan.